We invite you, your colleagues and your friends to increase the good work being done in education, group facilitation and leadership by attending our next creative facilitation and teacher training course in Mallorca. It’s a professional development training to gain more skills, confidence and processes that inspire, inform and create success in all our groups and learning environments. We love this work and we love to share it and make a difference by stimulating the foundations of education and training globally. Come join us. The jigsaw puzzle of groups learning and working together becomes an adventure in Creative Facilitation, Interactive Learning Methods, Personal Empowerment, Confidence Building, Workshop Planning and Skills Development as Robin inspires participants with her cutting edge learning methodology and supports all participants to have the skills, tools and confidence to create dynamic groups and support effective, fun and successful learning environments. This unique and highly acclaimed 6 day Training, developed and fine-tuned for over 24 years by Robin and Friends, is offered for Facilitators, Teachers, Trainers, Groups Leaders, Workshop Presenters, Change Agents, Community Development Workers and People in Creative, Healing and Sustainability Industries and often includes people involved in Permaculture, Community Gardens, City Farms, Transition Towns Initiatives, Environmental Education, Sustainability and Social Change as well as a sprinkling of conventional teachers, corporate people, healers, business planners, gender workers and key note presenters. people new to training and facilitation also find they are not overwhelmed or out of place. * The course equips people with the understanding and skills of what is ‘best practice’, leading edge’ learning and facilitation methods through immersion and practical hands on experiences. * It models and creatively empowers participants to create their own Dynamic Groups through putting together all the pieces of the jigsaw puzzle of what is important and often essential for effective learning and group work to be successful. This aspect probably makes it the most holistic learning methodology around. 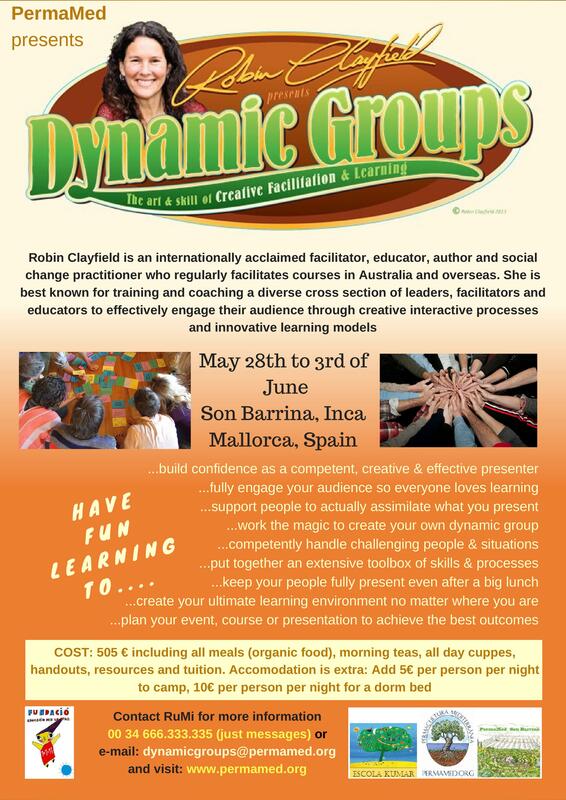 The ‘Dynamic Groups, Dynamic Learning’ Methodology is used as the basis for the course and by the end everyone has had the experience that ‘Magic happens in dynamic groups and learning happens easily’. Not only do they have this experience but they often get to feel what it’s like to facilitate this for others in the group. * It’s about achieving more confidence, fluency and often mastery in the art and skill of facilitating learning as opposed to presenting or teaching information using methods taught in Uni or Teacher Training colleges. * It’s not designed to assist people to teach a specific subject or topic though it does do that naturally. It’s aimed at supporting people to facilitate, teach, train or present any topic or subject or lead a meeting or group in a way that engages people, is motivating, fun and memorable and where everyone in the group has input and consequently is empowered by the experience. The success of these ‘Dynamic Groups’ is measured by smiling faces and virtually 100% positive feedback. * Creative planning methods and resource development bring much colour and aliveness to the course. * A huge ‘toolbox’ is built and expands throughout the course, full of creative processes, ‘glue processes’, all kinds of appropriate and useful processes. * The things that really set it apart from other learning methodologies and courses is the interactive learning environment, the creative processes and the underlying commitment to the empowerment of every people and the group as a whole. Robin Clayfield is an International Facilitator, Educator, Social Change Agent, Permaculture Pioneer and Author from Queensland Australia. She brings over 3 decades of Facilitation, her cutting edge ‘Dynamic Groups, Dynamic Learning’ Methodology plus abundant skills, processes, passion and a deep love of group work and caring for people. None. Being open to learning in a new way, sharing and contributing with a small dose of risk taking. We recognize that everyone has their own unique skills, knowledge and areas of interest to bring to the course. We use group work, creative and interactive processes, discussions, observation, games and practical activities as learning methods. This course is not just about imparting information, it is also about feeling empowered to integrate the learnings into your own life. We use practical and theoretical teaching methods to create a fun, lively and inclusive course. This course will be translated to Spanish as we go along (not simultaneously). 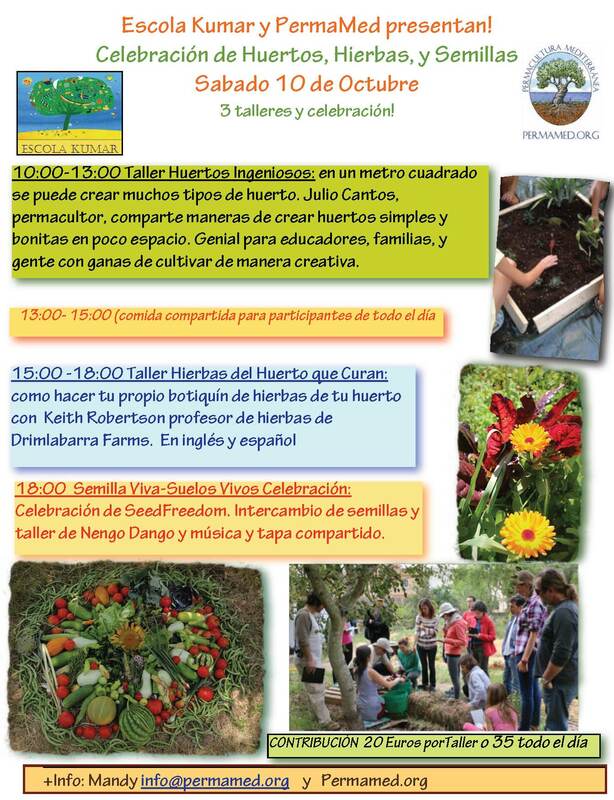 At Finca Son Barrina in Inca, the middle of the island of Mallorca, PermaMed is developing an innovative project called The Permaculture Circles, a forest garden designed by Julio Cantos Gazquez, one of the most experienced, respected and well-known permaculturalists in Spain. The form of the circles comes from the permaculture design practice of zoning, in which different human activities are represented symbolically in concentric circles, the sphere or circle being a natural pattern, capturing and demonstrating energy fields and movements. Son Barrina aims to provide a base for experimentation of sustainable human activities. The demonstration project is based on the development of a large multilayered agroforestry system known as a food forest where educational courses, workshops, and the like are held. Volunteers are welcome on Wednesdays to come help build the forest & the local community and to action learn strategies and locally effective techniques at the same time. Note on camping: Finca Son Barrina lies in a rural area so campers will be surrounded by farm noises. The sounds are more subtle inside the dorms (4 beds available). PermaMed is a Mallorca-based association that collaborates with a growing community to meet our needs by working with nature, learning and demonstrating how to build a truly sustainable society. Our activities aim to inform, educate, encourage and support people in redefining their basic everyday needs and getting actively involved in the production process in order to cover these needs, based on their own knowledge and their own resources, becoming less dependent on the goods and services of the global market. We work in network with other organisations and individuals around issues that apply to permaculture: agriculture, architecture, economics, health, renewable energy, ecology, and education. All meals, morning teas, all day cuppas, hand out notes and facilitation included. Accommodation is extra as there are different options. 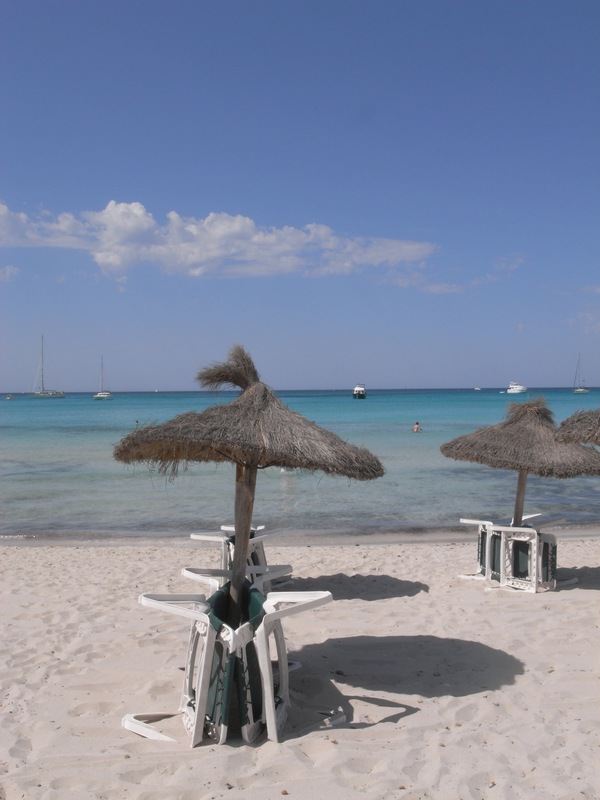 Add 5 € per person per night to camp and 10 € per person per night for a dorm bed (bring your sheets or sleeping bag). Bring a friend and we discount you 100 €, payment is also possible in Talent (the local social currency) or through other creative means. Costs must however be covered so there is limited movement on what we can offer you. Tell us though if you bring a specific skill to the course. Contact RuMi via email dynamicgroups@permamed.org or Aline via message on the mobile phone number 0034 666 333 335 (will get back to you asap, often no coverage where working/studying). ¿Qué es un Curso Certificado de Diseño en Permacultura (CDP)? En un CDP aprenderemos las éticas y los principios que utiliza la Permacultura para diseñar y crear espacios y vidas sostenibles. El Diseño en Permacultura ofrece un kit de herramientas, habilidades prácticas y conocimientos para poder construir comunidades y estilos de vida resilientes, sea en tu hogar, tu centro educativo, tu trabajo o tu pueblo o barrio. Tomar un curso de Diseño en Permacultura muchas veces significa un cambio de vida ¡Estáis avisados! PermaMed intenta vivir en el pulso de los tiempos que corren y por eso esta vez hemos diseñado un curso semi-presencial, con la ilusión de así ser más inclusivo el curso para trabajadores en general y gente con familia, que no dispongan de tanto tiempo libre en bloque. Además, PermaMed ha querido ofrecer unas horas extra de prácticas aparte de las 72 horas que Bill Mollison estipula en el currículum clásico, de manera que se ha diseñado un ciclo de módulos repartidos en 4 meses, para así poder digerir mejor lo aprendido, profundizar la experiencia haciendo prácticas en casa o en tu centro educativo entre los módulos y ver los cambios en nuestro entorno con el tiempo. Empezaremos a finales de febrero y acabaremos antes del fin del curso escolar. El desarrollo del curso seguirá los pensamientos de una educación activa (Qué es? ), habrá sesiones teóricas además de prácticas, habrá dinámicas y tiempo de reflexión, debates intergrupales y un proyecto en grupo de diseño final. Estaremos aprendiendo juntos, de una manera cooperativa y con un objetivo principal, como ofrecer la máxima diversidad de ejemplos prácticos, así que cuando podamos, visitaremos otros lugares demostrativos a parte de los de PermaMed (nuestros sitios demo aquí) entre módulos. Después de haber cursado todos los módulos, haber entregado todos los trabajos “online” y haber presentado un diseño en grupo, obtendrás el Certificado de Diseño en Permacultura, reconocido internacionalmente. Julio Cantos (Permacultor diplomado y Técnico agrónomo, especialista en Jardinería y Paisajismo Comestible y de Conservación), Miquel Ramis de Artifex Balear (certificado en permacultura, maestro de Bio-Construcción y Tecnologías apropiadas), Equipo PermaMed y otras personas inspiradoras. El CDP se ofrecerá en varios sitios de demostración de permacultura en Mallorca como: Escola Kumar, Son Barrina, Artifex Balear y otros. Los sábados indicados más abajo estaremos juntos de 09:30 a 18:30 (8 horas de clase más 1 hora de comida), el último módulo es más largo, practicaremos lo aprendido de Permacultura Social en una convivencia y celebramos nuestro proceso de aprendizaje. Entre módulos habrá trabajos a entregar “online”, abriremos una carpeta en el Google Drive, plataforma gratuita donde podemos profundizar nuestros conocimientos con recursos varios y colaborar en nuestros diseños. Aparte de tener acceso a un ordenador con internet, necesitas una cuenta Google, cosa que es tan fácil como sacarte un correo electrónico (gratis) de gmail. Tenemos un acompañante de trayecto disponible para ayudarte con esta parte si es nuevo para ti. ¡Sacaremos provecho de las “Tecnologías Apropiadas” de las cuales hoy en día disponemos! Antes de empezar el curso se hará una reunión informativa. Reunión informativa y explicación de metodología “online” – apertura de carpeta en Google Drive (traigan su portátil o smartphone si tienen). Cada semana abriremos una carpeta más con recursos, ejercicios, debates de grupo, lecturas y/o videos y trabajos a entregar. Si quieres obtener el Certificado de Diseño en Permacultura es imprescindible haber hecho mínimo un 80% de lo propuesto en esta parte no-presencial. A calcular 25 horas durante todo el curso (aprox 2 horas por semana). Esto hace un total de 79 horas de aprendizaje guiada, pero aquí no se para! Horas opcionales: Cada miércoles nos juntaremos con otros voluntarios en el proyecto de voluntariado de Los Círculos de la Permacultura (en Son Barrina) para repasar los nuevos conocimientos aprendidos, fomentar nuevas habilidades y para aclarar eventuales dudas. 3 horas por semana, miércoles de 15 a 18 horas. Cada jueves habrá voluntariado en el centro educativo Escola Kumar, siguiendo el mismo formato con los mismos objetivos. 3 horas por semana, jueves de 15 a 18 horas. Habrá días de excursión y/o talleres en los fines de semana entre módulos. Los participantes del CDP podrán asistir a un precio reducido. Eso hace que además de las horas lectivas en los módulos exista la posibilidad de juntar horas de coaching y muchas horas más de experiencia en el terreno si quieres formar parte de los proyectos comunitarios de PermaMed en nuestros espacios demostrativos (confirmen horarios de los voluntariados por email por favor). Hemos recibido una subvención de la Fundació Educació per la Vida para apoyar la introducción de la Permacultura en el currículum escolar y en la educación informal de jóvenes. Por esta razón hemos solicitado también los créditos de la Conselleria de Educación. Así, aunque está abierto y alentamos la participación de todos en la comunidad, el curso tendrá un enfoque especial en métodos de aplicación de la Permacultura en el aula con puntos concretos donde enlazar al currículum y herramientas prácticas como “kits” educativos. Adolescentes y jóvenes interesados están especialmente bienvenidos al curso. Tenemos un grupo de jóvenes ya implementando proyectos de permacultura en sus vidas y lo vean como un camino positivo y útil. Cuota reducida a confirmar. 1/ Hemos recibido una subvención de la Fundación Educación per la Vida para apoyar la introducción de la Permacultura en el currículum escolar. Por esta razón hemos solicitado también los créditos de la Conselleria de Educación. Aunque el curso tendrá un enfoque especial en métodos de aplicación de la Permacultura en el aula con puntos concretos donde enlazar al currículum, está abierto y alentamos la participación de todos en la comunidad. 2/ Siendo un proyecto piloto en formato semi-presencial, os ofrecemos un precio de lanzamiento. El precio para el curso entero es de 400 Euros + la acomodación del último módulo aparte. Precio reducido de 360 Euros por pago adelantado. Las comidas en los días de talleres presenciales se organizan entre todos (tipo buffet). En caso de no llenar cupo para el curso completo, existe la posibilidad de acudir a talleres sueltos (los 5 primeros) a 50 Euros por taller presencial (no hay certificación ni créditos de conselleria para talleres sueltos). 1) Reserva de plaza para el curso entero antes del 11 de febrero con descuento por pago anticipado. Total a pagar 360 Euros para este curso de certificado de diseño en Permacultura con validez internacional. Haciendo esta modalidad de pago, ayudas enormemente a la organización y gestión del curso. ¡Muchas gracias por tu esfuerzo! 2) Reserva de plaza pagando un depósito de 100 € (pagando el último módulo) antes del 11 de febrero. El resto del pago (300 Euros) se puede fraccionar (a confirmar con el equipo de PermaMed). 3) Sin reserva de plaza, pagando 50 euros por cada módulo. Este modo de pago no incluye el acompañamiento “online”. Sólo será posible en caso de vacantes. Posibilidad de obtener puntos hacía el CDP con PermaMed para completar hacía la certificación en futuras ediciones. Inscripción:¡Plazas limitadas!Esperemos que te animes a aprender con nosotros, profundizando en el conocimiento de la Permacultura, compartiendo herramientas y soluciones prácticas para una vida y una educación más consciente, ecológica y económica. Te invitamos a compartir tus proyectos, diseñar tus sueños y aplicarlos en la vida real con el apoyo de una comunidad de permacultura en Mallorca, creciendo cada día. ¿Te apuntas? Rellena el formulario y con tu pago de reserva o curso completo queda registrada tu inscripción. Si tienes dudas o preguntas, tb nos las puedes pasar en el formulario, o por email en el correo formacion@permamed.org. COMPLETO! !¡A POR UN CAMBIO DE PARADIGMA, NOS VEMOS EN EL CURSO! 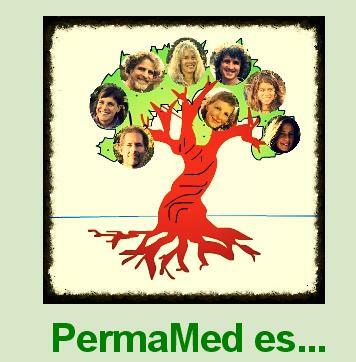 Join Robina McCurdy, Alfred Decker, and the Permacultura Mediterránea (PermaMed) team for a life-changing two week Permaculture Design Course (PDC) on Mallorca. The PDC is a 72-hour certified and holistic course encompassing a wide range of topics that demonstrate how to work with our ecological, economic and social environment. Hosted at Finca Son Barrina, a lovely six hectare organic farm in the centre of the island, and the site of Mallorca’s first organic food shop, the PDC will be composed of lectures, discussions, practical activities, and design exercises. Participants will gain knowledge and skills to enable them to design and implement the principles of permaculture in the creation of truly sustainable systems that can enable us to live well and with respect for each other and the earth. 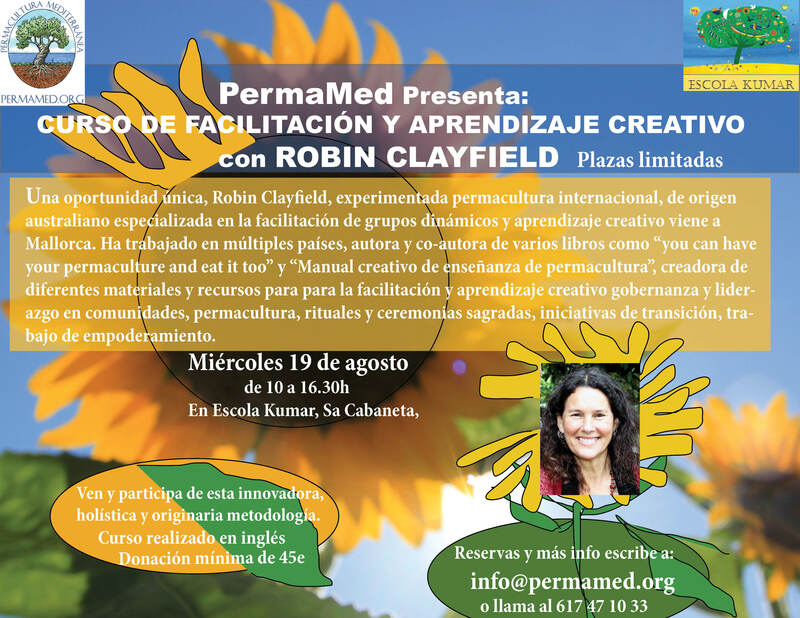 PermaMed is proud to host guest teacher Robina McCurdy, one of the most-respected and active permaculturalists working on an international level (see bio below). Permaculture offers practical skills and methods for designing and creating regenerative living systems, integrating human needs with the ecosystems in which we are rooted. It is a theory of ecological design which seeks to develop sustainable human settlements and agricultural systems, by modeling them on the diversity, stability and resilience of natural ecosystems. EARTH CARE: Provision for all life systems to continue and multiply. PEOPLE CARE: Provision for people to access those resources necessary for their existence. FAIR SHARE: By governing our own needs, we can set aside resources to further the above ethics. Permaculture ethics offer a direction to responsibilities, moral values and livelihood. They provide the vision on which design approaches and strategies can be tested. Would you benefit from a Permaculture Design Course? People from widely diverse backgrounds and interests have experienced and transformed their land since the first PDC was offered in 1972. Farmers, ranchers, landowners, foresters, landscape designers, architects, builders, planners, developers, accountants, financiers, bankers, publishers, attorneys, aid workers, educators, environmentalists and high school students have all brought permaculture techniques into their homes, businesses and communities. approaches to design including: mapping; designing from patterns to details; analysis of elements; using slope & orientation; and analysing the needs and yields of systems. how to increase productivity using intensive garden design strategies including: stacking, soil-building, mulch, nutrient cycling, pest control, green manures, worms, compost & companion planting. how to survey landscapes for property design using simple and sophisticated tools; mapping and map making; and site analysis and assessment. how to create and enhance micro-climates, and create design strategies for all major global climatic zones. how trees and forests regulate and moderate ecosystems; how to sustainably use, propagate, harvest and manage tree systems using techniques such as grafting, shelter belts, orchards, guild planting and succession planning. how to save money on energy bills with efficient home design, retrofitting, and renewable energy systems. multiple uses for greywater; constructed wetland design; and other techniques for treating “waste water”. passive water hydration and infiltration, rainwater collection, storage and composting toilets. using reconstructive earthworks, water harvesting and soil conditioning to recharge ground water, re-hydrate and drought-proof the landscape. how to bring fertility back to the land and build topsoil through a diversity of ancient and modern techniques. how to cycle nutrients and incorporate animals into your system using innovative techniques such as chicken tractors, pannage systems, pigeon lofts, dairy systems and beekeeping. creating living ecosystems that feed and nurture us and future generations. Design through the use of nature’s rules to create a lush and resilient natural environment. how to design solar-heated buildings (including cold-climate greenhouses). The use of natural building materials, energy efficient house placement and design and the assurance of a healthy indoor environment. strategies for creating community-wide sustainability, village development, alternative economies, local currencies, and how to organize community groups. During the two week course (two six day segments with a day off in the middle to go to a beautiful beach), you will be supported in making an individual design (it could be farm, an apartment, a city block, or a community), as well as participate in a group design. This course is for you if you want to gain practical analytical skills and perspectives for living sustainable and productively. The PDC serves as the foundation for further permaculture work and study, and is a prerequisite for the Diploma in Permaculture Design. Credit for this course is now accepted by a growing number of universities around the world. Thousands of permaculture designers worldwide have been certified through this course and now comprise a global network of educators and ecological activists who regenerate degraded landscapes, create new businesses and communities, influence government and corporate policy, and change the way we view and re-design our environments. The PDC is a course about how to design, for the most part it is not a hands-on course where you garden, build, create ponds, make compost, etc…although there will be some of that :-). Permaculture is a holistic system that needs to be understood in its entirety, after which you will be ready to go out and do as much practical work as you like! This means that while we will touch on the above topics, and will do some hands-on experiential learning, our focus is to provide you with foundational knowledge so you can then create designs which are integrated, appropriate, and darn clever. We’d like to offer an exclusive option for parents who couldn’t take this PDC if they weren’t able to bring their children along. In this case we will offer activities for a limited number of children based on the educational philosophy of “educación viva”, an active accompaniment with an attitude of listening, love, and interest in the children’s needs. However we’d like to stress that this offer only exists for parents who really need to take up this option in order to be able to take part in the PDC. How will the children be accompanied during the PDC? The adult companions will propose activities and workshops and the children can choose how they will study the subjects that their parents will also be studying that day. There will be a fun activity with children and adults together at some point during each day. Create a space and opportunity for families to learn together. Demonstrate permaculture and its principles through experimentation and play. Accompany individual and collective learning processes. There will be dedicated spaces for the children, both inside and outside. Although we will cater for the safety and well-being of the kids, please be aware that Finca Som Terra is a farm with animals and other common farm hazards. Price to be confirmed. Contact eco-kids@permamed.org for more information. 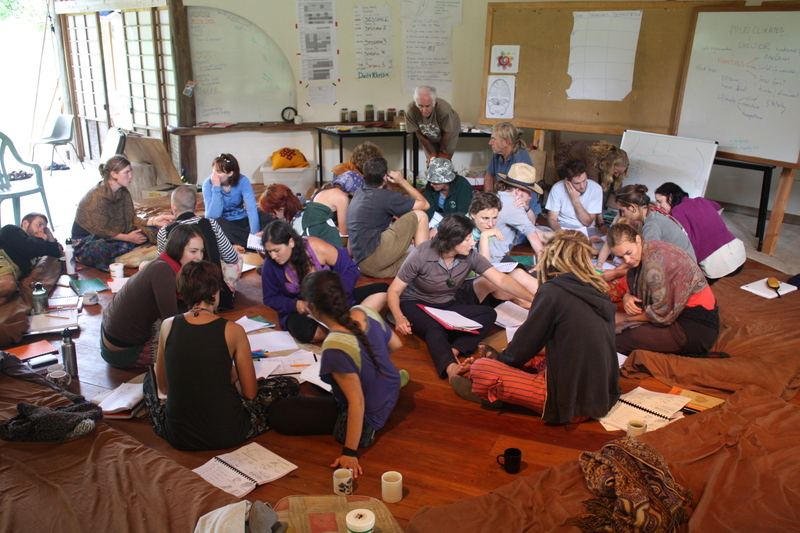 The Permaculture Design Certificate Course is a dynamic learning experience—concentration and learning can be quite intense. We strongly recommend that you come well prepared by learning and reading as much as you can about Permaculture before coming to the course. Recommended reading: Rosemary’s Earth User’s Guide to Permaculture. Other resources (mostly in Spanish) can be found here on our website. Bring basic plan and photos of the land/place you want to work on designing during the PDC. The course sessions will take place outside when there is good weather. We work in network with other organisations and individuals around issues that apply to permaculture: agriculture, architecture, economics, health, renewable energy, ecology, and education. Aside from The Permaculture Circles, PermaMed has two other demonstration sites in development: Escola Kumar, and Finca Som Terra. Each site has its own focus and characteristics: Som Terra is devoted to regenerative agriculture using animals (cows and pigs) and tourism, Escola Kumar to small scale gardening, and social and urban permaculture. 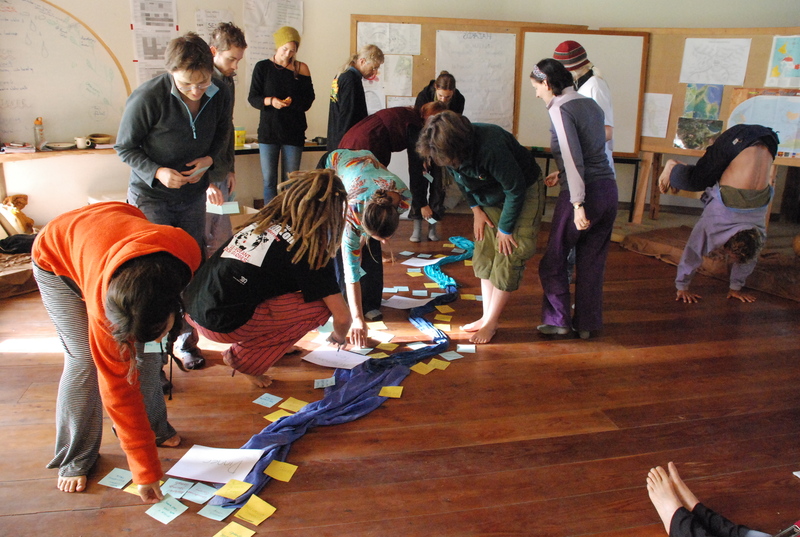 Coming from Aotearoa-New Zealand, Robina is a dynamic, participatory-style, outcomes-based educator. 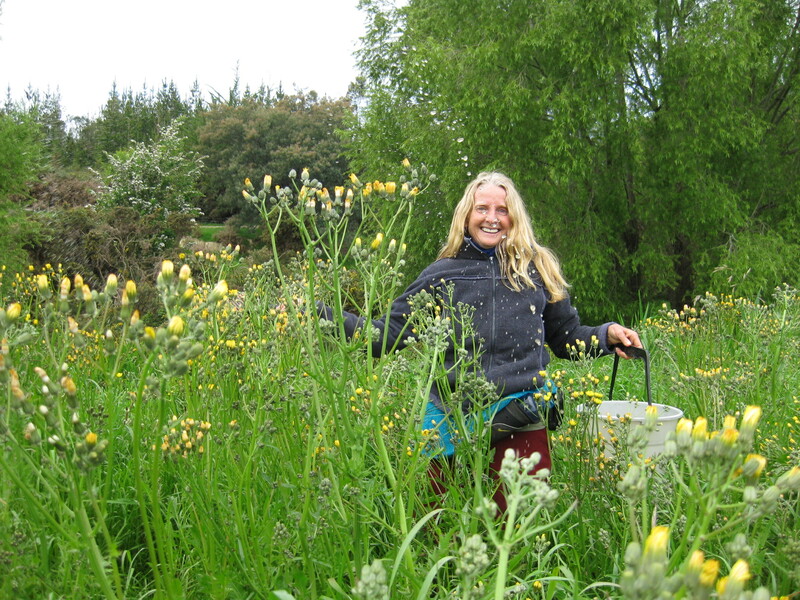 Over the past 30 years she has worked nationally and globally as a Permaculture educator/designer, organic growing tutor, documentary producer and community development facilitator. Robina is the founder of Tui Land Trust (www.tuitrust.org.nz), SEED (www.seed.org.za), Institute of Earthcare Education Aotearoa (www.earthcare-education.org), and currently, The Localising Food Project (www.localisingfood.com). She has published range of educational materials which offer tools for developing sustainable communities with a practical grounding in permaculture, with participatory processes for collective decision-making and action. The ‘Localising Food Facilitators Manual’ and ‘Grounding Vision, Empowering Culture’ are guidebooks for community development facilitators. Robina has taught and applied her powerful community-building methods with households, neighborhoods, schools, farms, ecovillages & bioregions, in Aotearoa/New Zealand, Australia, Southern Africa, Great Britain, Brazil & North America. 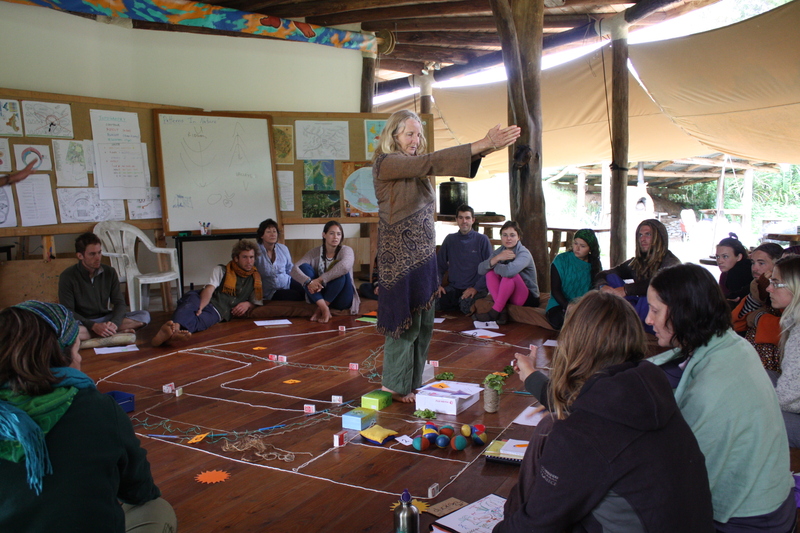 She has taught twenty PDCs, five permaculture teacher training courses, and hundreds of hands-on permaculture workshops. In recent years she worked as the designer/co-ordinator of the Victory Community Health Gardens (Nelson) and a sustainability consultant in post-earthquake Christchurch, with ‘Project Lyttelton’s ‘Harbour Basin Food Resilience’ project. Re-connection with nature, creating harmonic living environments, mobilising communities for dynamic resilience and empowering people as agents of positive change, underpins all of Robina’s work. Robina will be with us for the first week of the PDC. 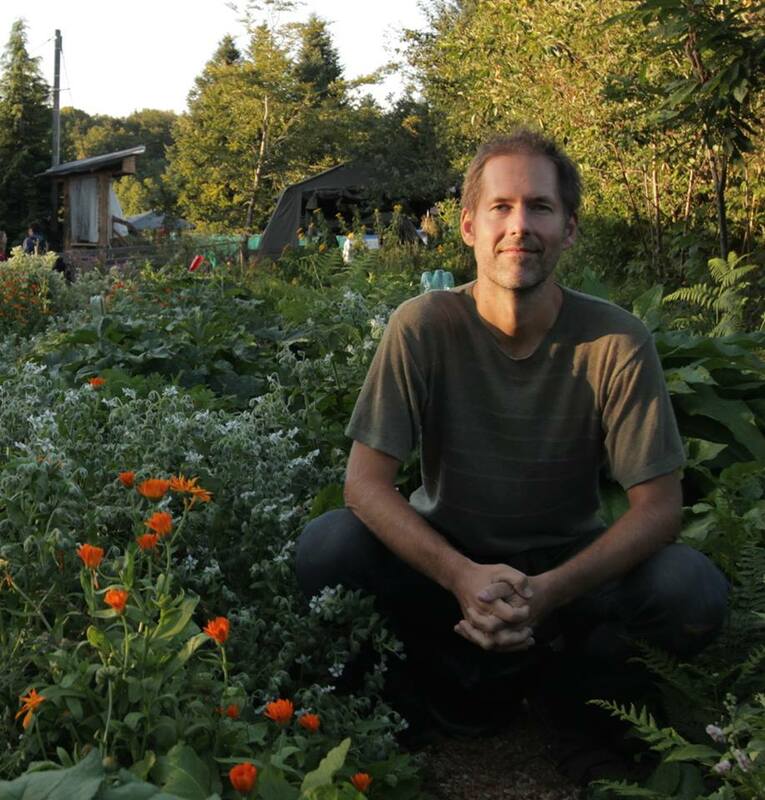 Lead facilitator Alfred Decker’s passion in life has been ecological and social justice activism, of which permaculture has played a central part. “I love the natural world, and working with nature through permaculture has helped to ground and sustain me.” Since his first PDC in 1998 in California, Alfred has been involved with social movements and projects throughout Europe and the Americas. He is the founder of Permacultura Barcelona and the Forest Gardens project at Can Masdeu, is a member of the Permaculture Council of Europeand participated in the European Permaculture Teachers Partnership, and recently completed a post graduate diploma in sustainable architecture and renewable energy (Centre for Alternative Technology, Wales). After taking a permaculture teachers training with Rosemary Morrow in 2011, he undertook a two year mentorship and later co-taught five courses with Rosemary, ultimately earning a diploma in Permaculture Education & Community Development in 2013 through her organisation Blue Mountains Permaculture Institute in Australia. He also co-edited her forthcoming manual “Permaculture Teaching Matters” and organized a successful crowdfunding campaign to create a digital platform for her life’s work in teaching. Alfred has taught widely throughout Europe, and in 2014 left his beloved Barcelona in order to move to Mallorca and collaborate with PermaMed. Julio Cantos Gázquez is one of the Mediterranean’s foremost experts on forest gardens and ecological forestry, as well as a widely-respected permaculture teacher, practitioner, and diploma holder. He is coordinator of the The Permaculture Circles project at PermaMed Son Barrina; the Spanish representative instructor of theInternational Analog Forestry Network; and the co-founder of PermaMed. Mandy Merklein, is a biologist, environmentalist, and Certified Permaculture Designer, (PDC with Darren Doherty), dedicated to supporting our transition to a more conscious, holistic, and resilient life. Her focus is in cultivating ecological subsistence gardens, homesteads, and communities. Mandy’s thesis in 1982 was on overcoming peak oil/resources and creating transition pathways to sustainable communities. She has worked as an ecologist, conservationist and program manager for over 30 years on four continents. Mandy has over 25 years of practical community gardening experience. She is a co-founder of PermaMed and Ecology and Community Resources with her husband Bruce Robson (also a biologist and PDC/Doherty). She has coordinated previous PDC and Gaia EDE courses on Mallorca, where she lives as mother and householder, and manages, with her family, the Escola Kumar, a permaculture demonstration site and holistic living and education center. Anne Caroline Sulzer is a Certified Permaculture Designer and Graduate in Tourism and Hotel Management. 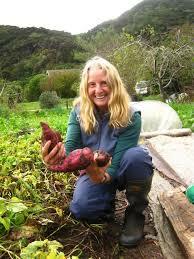 She completed her PDC in 2012 in Australia at Southern Cross Permaculture. During her 1 year study journey through Australia, she has gained hands-on experience and learned from inspirational teachers. In addition to that, Caroline completed two Permaculture Teacher Trainings with Rosemary Morrow and Andy Goldring from the Permaculture Association UK. After having taken a Holistic Management course in 2013, she started to specialize in soil regeneration and Holistic Management. Caroline is the founder of Finca Som Terra and our host for the PDC. Aline Van Moerbeke, Certified Permaculture Designer (PDC 2011 with Richard Perkins and PDC 2012 with Julio Cantos), passionate about the diversity of cultures and new experiences to be lived on this planet, hence her choice of university studies: Sinology. Having left the Mallorcan real estate world, she is particularly interested in leadership for change and alternative economies, as well as applying Permaculture in a (semi) urban environment. RuMi Nicolau Ordinas, Certified Permaculture Designer, elementary school teacher with a degree in psychology. Active seeker of new ways of teaching and learning, pedagogical designer of workshops, educational programs, and permaculture teaching tools from a holistic, systemic, ecological and sustainable vision. Disciple of Robin Clayfield (specialist in dynamic group facilitation and community leadership. Active member of the PermaMed in communication and the management and organization of courses/events. She is passionate about the study and investigation of new forms of social, economic, ecological, and horizontal organization. Daniella Querol, Certified Permaculture Designer, studied Fine Arts in México and Germany and took three masters in documentary and experimental filming as well as photography for cinema in Germany and Barcelona. She dedicates herself to child development through “educación viva” and will be organising the children’s activities during the course. Es una oportunidad única, poder tener esta maestra australiana con tanta experiencia y sensibilidad a la hora de transmitir conocimientos y quien formó parte y sigue viviendo en la primera comunidad diseñada con principios de la permacultura Crystal Waters, en Australia. El taller se realizará el miércoles 19 de agosto, de 10 a 16.30h y gracias a su generosidad, por sólo una donación mínima de 45e. Las plazas son limitadas por orden estricto de llegada. Para más información o reservas contacta en info@permamed.org. Por temas logísticos el taller se realizará en inglés. Ven a pasar un día de verano diferente en la Escola Kumar y contágiate de pasión por cambiar positivamente nuestro entorno.